In a battle of two teams without a win, something had to give. 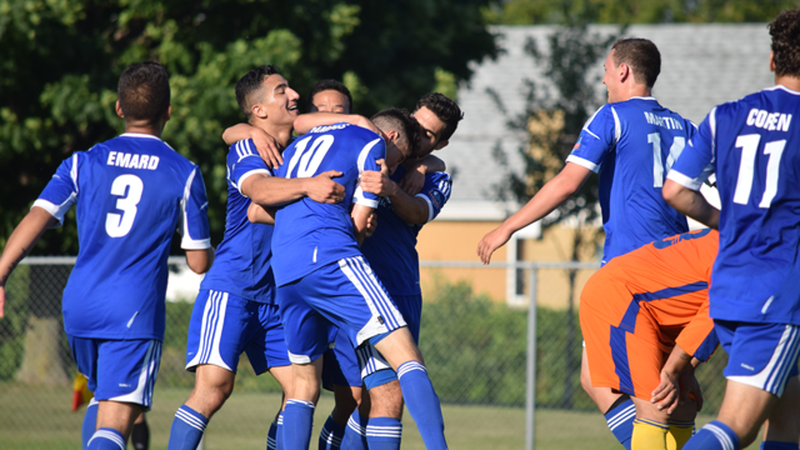 In this particular battle, Internacional de Toronto had the upper hand for sixty minutes before Cataraqui Clippers' Timothy Campos took matters into his own hands to lead the Clippers to their first league win. The match began with some rough play, especially between the two central midfielders from either team, Clippers' Jason Massie and Inter's Joshua Portillo, eventually leading to cautions for each in the thirtieth and thirty-second minutes respectively. Before that clash had even come to a head, Adrian Gallo finished a brilliant team move from Inter to score a smashing goal from twenty-five yards with a bullet of a shot into the top right corner. Much of Clippers' attacking play went down their left flank, using the speed and skill of Antonios Assaad against Parham Taher, but he was unable to create any solid chances for his team. On the other side, Inter were trying to use long passes down the wings to Roheem Edwards. In the twenty-third minute, this tactic almost gave Inter their second goal, but Thomas Daechsel was equal to the task and able to clear the ball out to the wing. In the thirty-eighth minute, Inter's constant pressure and probing paid off as the Clippers' defense made a mistake and Daechsel's clearance hit Edwards. His short range tap-in gave Inter a 2-0 lead. In an attempt to shake up his team, Chris Eveleigh brought Andrew Martin on in place of Dylan Bams in the forty-first, and the change paid off within sixty seconds as Martin scored Clippers' first goal of the day on a low cross from Massie to make the game 2-1, a score line that held until halftime. The second half began much the same as the first ended, chippy with end-to-end play, but no good chances either way. Inter began changing things up in the fifty-first minute with Anthony Coquim replacing Taher, and in the fifty-seventh when Manuel Ramos replaced Portillo. Nolberto Solano's tactical changes paid off as Edwards was able to get inside the Clippers' defense and roofed one from short range to give Inter a 3-1 lead in the fifty-eighth minute. Clippers finally found an answer ninety seconds later, when Campos scored his first of the day in a goalmouth scramble, just as a substitute was being prepared for him. Five minutes later, Clippers began to prepare the substitution again, but Campos made his presence felt for a second time, firing one low and hard across the goal that forced Inter's Kyle Watson into a blocking slide that turned the ball into his own goal and tied the game up 3-3. Moments later, Inter had their own chance at the other end as Li Tong Jian struck one off the post with the goalkeeper nowhere to be seen, but in the sixty-ninth minute Campos scored again, this time flicking the ball up and over Bravakis from close range, giving Clippers their first lead of the game. Both teams were forced into injury changes in the seventy-sixth, with Inter replacing Adrian Gallo with Hugo Vaz and Clippers removing Assaad for Joel Zelt. Three minutes later, Tommy Hong was put in alone from half, but Bravakis was equal to the task. Unfortunately, for the visitors, Martin was following-up and scored his second of the day to give Clippers an unassailable 5-3 lead. Cautions for unsporting behaviour were given to Clippers' Dylan Kirk and Inter's Watson on either side of the finaly goal, and Watson's second caution in the eighty-eighth resulted in his dismissal from the match. Both teams made the remainder of their changes to finish off the game, with Clippers finally replacing Campos with Greg Simmons in the eighty-fifth, and Stephane Emard and Oliver Coren both being replaced by L1 debutantes' Boris Baker and Omolade Ogunsanya. Meanwhile, Inter replaced their centre midfield engine Felipe Nunez with Cesar Ortiz in the eighty-eighth, and Edson Jimenez was called into action in added time replacing an injured Tong Li. The final whistle blew and Clippers claimed their first league win of the season to the applause of the fans. After the match, Eveleigh could express nothing but relief at finally winning a league match, and commented that the Clippers would continue to play the way they play, even though it has not always led to results thus far. Inter's Solano was disappointed at the end result, and commented that his team was still lacking some match fitness, which would always prove difficult when players are not fully professional and training daily in a controlled team setting.